The United States Guest House, Blair House, is composed of four connected town-homes of which two face Lafayette Park on Jackson Place and two located on Pennsylvania Avenue. This historic complex has more than 120 rooms and a total area of over 60,000 ft.². There are 18 full-time employees on staff to oversee all aspects of maintenance and hospitality. Blair House has 14 beautiful guest rooms, and each guest room has a full bathroom. There are two large conference rooms, three formal dining rooms, and a cold and hot kitchen. The kitchens are overseen by a sous chef and an executive chef. This guesthouse also includes an exercise room, a fully equipped beauty salon, and complete in-house laundry facilities. The Blair House gardens became part of a major renovation of the entire guesthouse in the 1980s. The gardens received funding from generous donations from Fleur Cowles, the small interior courtyard, Mr. and Mrs. Jack Massey, the front gardens which face Pennsylvania Avenue, and Arthur and Janet Ross, the large interior garden. The Blair House was originally constructed in 1824, and it soon became the central political point in Washington DC. Francis Blair had the job of the court clerk in Frankford, Kentucky. He wrote many editorials for his local newspaper, and these editorials soon attracted the attention of President Andrew Jackson. President Jackson invited Mr. Blair to Washington to assist a failing DC newspaper called the Globe. Mr. Blair and his wife and their three children accepted the invitation to come to Washington DC. Seven years later the family took possession of a home owned by the first Surgeon General of the US Army. This home quickly became known as the Blair House. The United States government purchased the Blair House in 1942. Up until this time, the US government used either a hotel, an embassy suite, or the White House to accommodate visiting guests. After frequent trips by Winston Churchill, President Roosevelt decided that there was a need for an official diplomatic guesthouse. This prompted the president to pursue the purchase of the Blair House which included the Blair family’s china, furniture, silverware, and so forth. Some of the historic visits from hundreds of guests to the Blair House include General Charles de Gaulle, President Ferdinand Marcos, President Boris Yeltsin, Queen Elizabeth II, President Nelson Mandela, Prime Minister Golda Meir, King Mohamed VI, Prime Minister Margaret Thatcher and many other dignitaries and famous people. The Blair House has been the site of American Diplomacy for many decades. 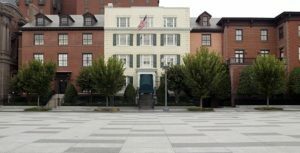 Besides functioning as the primary guest house for visiting foreign leaders, the Blair House has staged a many internationally focused events which have helped to advance America’s many relationships with foreign nations. Some of the events include the summit of the G8 foreign ministers, the State of the Administration briefings by Cabinet members, and even a healthcare summit with leaders of the Congress. If you have an opportunity to visit Washington DC, it would be well worth your time to see this beautiful piece of history. Check out the map below for easy directions to the Blair House from Bruckheim & Patel’s Office in Washington, DC.